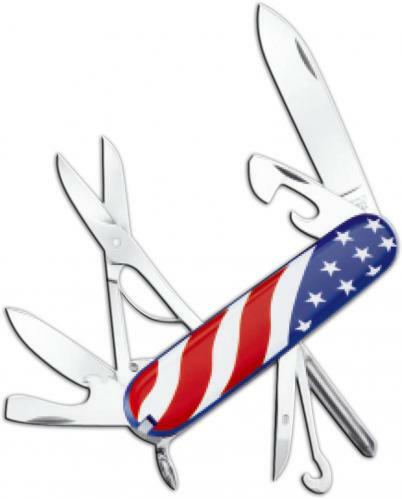 The illustrated Victorinox Knife is the Victorinox Super Tinker Knife with Red, White and Blue U. S. Flag handle. The components of this Victorinox Knife include a large blade, small blade, Phillips screwdriver, can opener with small screwdriver (also for Phillips screws), bottle opener with large screwdriver and wire stripper, reamer with sewing eye, scissors, multi-purpose hook (parcel carrier), toothpick, tweezers and key ring. The Victorinox Super Tinker Knife with Red, White and Blue U. S. Flag handle has a closed length of 3 1/2".